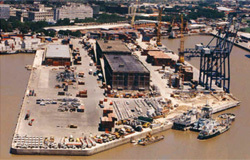 Operators: Terminal Buenos Aires S.A. Extent: Basin D Southside, Pierhead No 4, together with grain elevator and adjacent truck parking space/railway sidings. Basin D southside: Berths 1 and 2. Total quay length 585 meters. 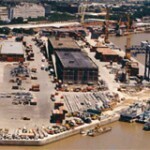 Berth N º 1 suitable for vessels up to about 250 meters LOA. Vessels of up to 220 meters LOA can load without shifting. Depth alongside: 6,60 to 7 m (21 to 23 ft) at datum. Berth normally not in use for vessels operating with cargoes (grain loading installations destroyed by fire 1983, up to date no plans to reconstruct), but has been used occasionally to discharge bulk fertilizers using ship´s gear/grabs to trucks. Reception parking for about 200 trucks, delivery rate up to 700. T.P.H. ; railway siding for about 100 railcars, delivery rate up to 800 T.P.H. this terminal has a storage area for container and general cargo. A bonded warehouse of 3.500 sqm is also available.